People who follow our tours know that we coordinate online campaigns for many interesting and often unique books. This summer we have some very unique books and authors on the schedule. 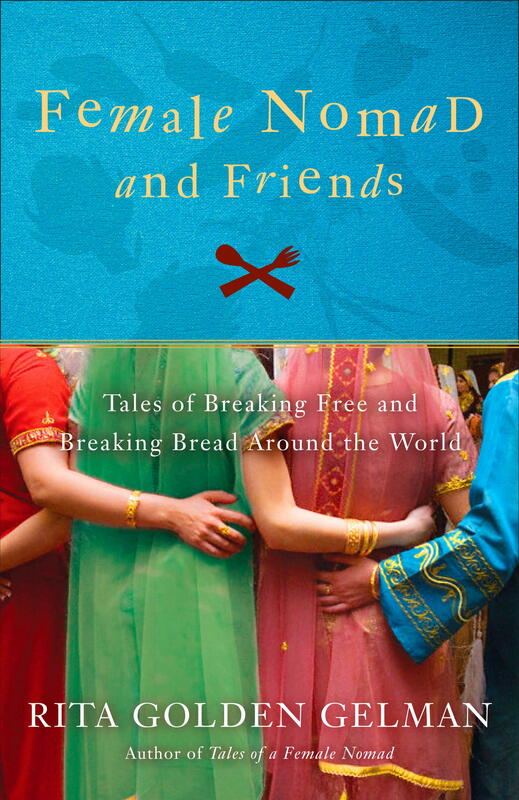 One of those includes Rita Golden Gelman, author of Female Nomad and Friends: Tales of Breaking Free and Breaking Bread Around the World. This book is a celebration of wonders and joys of cross culture connections and it is a collection of stories and recipes from over 40 authors from around the world. What an awesome summer read – and we want to send out a big thank you to all the bloggers who participated in this campaign. Some of the topics in this book include: women’s interests, world travel, food from multiple cultures, overseas cultures, independence, connecting globally, faith, risk taking and international food. We have a variety of excerpts that our tour hosts used on their blog – these are the topics. Click the link to read more. Monday June 7 – Lee Erickson share her review and much more about Rita Golden Gelman and Female Nomad and Friends on her blog – http://cookaroundtheblock.blogspot.com/2010/06/female-nomad-and-friends-by-rita-golden.html. Tuesday June 15 – Lee Erickson share her review and much more about Rita Golden Gelman and Female Nomad and Friends on her blog – http://cookaroundtheblock.blogspot.com/2010/06/female-nomad-and-friends-travel.html . Tuesday June 22 – Krista Herling shares her thoughts about Female Nomad and Friends by Rita Golden Gelman on her blog – http://www.welcometomarriedlife.com/2010/06/female-nomad-and-friends.html She also share her thoughts about Tales of a Female Nomad and her contact with the author, Rita Golden Gelman. There has been a trend with this tour – where we’ve seen a wide variety of women who were touched personally by each of these books and also by the opportunity to reach out to Rita Golden Gelman, through her email address and invitation to connect in the back of Tales of a Nomad. This tour is providing many examples and stories of why YOU need to read this powerful book. Wednesday June 23 – Maria Altobelli shares an excerpt about “Soul Food” from Female Nomad and Friends by Rita Golden Gelman – on her blog http://blog.mexicoinsmallbytes.com/?p=29 and also, http://blog.mexicoinsmallbytes.com/?p=41. She will also be posting interviews with some of the authors and talking about many aspects of this book over the summer. You will want to subscribe to her blog – to keep up with all the details. There is much more to come. Monday June 28 – Joyce Anthony shares information about Female Nomad and Friends and information about Rita Golden Gelman on her blog – http://joyce-anthony.blogspot.com/2010/06/taking-stay-cation-with-female-nomad.html – Joyce makes the suggestion that this is a great “stay-cation” book. I would like to participate in the Female Nomad & Friends blog tour! and will contact Nikki. I loved Rita’s first book, and I’m very excited about her new anthology “Female Nomad & Friends”! Rita is also hosting a 24-hour Global Dinner Party (all over the world) to celebrate the launch of her book, connect with friends over food, and is giving all the royalties from book sales to fund scholarships for slum kids in New Delhi to attend vocational school. Details are posted on her website at http://www.ritagoldengelman.com, and her Facebook fan page “Female Nomad” at http://www.facebook.com/femalenomad. We’re all invited!